Among the multiple facilities on the 500-acre IMG property is a 5,000-seat stadium. Photo courtesy of IMG Academy. 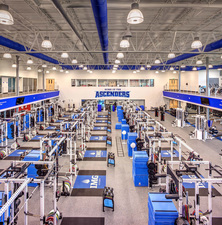 The IMG Performance and Sports Science Center includes a 12,000-square-foot weight room. Photo courtesy of IMG Academy. Photo courtesy of IMG Academy. 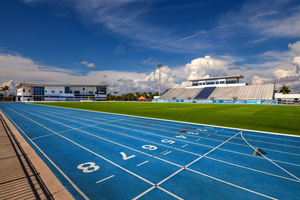 Among the multiple facilities on the 500-acre IMG property is a track and field training area. Photo courtesy of IMG Academy. 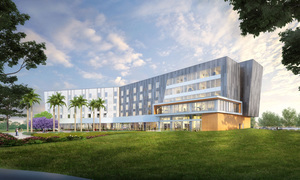 The Legacy Hotel at IMG Academy, situated on the edge of campus, will offer luxury accommodations and facilities to IMG clients and visitors to the Bradenton area. It is expected to open in the fall. Photo courtesy of IMG Academy. From tennis legends to football powerhouses, IMG Academy in Bradenton has provided a campus for training and educating the sports world’s biggest stars, and along the way helped turn Southwest Florida into a sports capital capable of producing the greatest athletes on the planet. As the school opens a new boutique hotel, its reputation as a world-class sports destination grows with the same grace and speed that IMG graduates tally grand slams. An October groundbreaking for The Legacy Hotel, a 150-room upscale boutique hotel on the edge of campus, marks the most recent and perhaps most posh lure for top-notch sports stars to train at IMG. From the school’s beginnings in 1978, however, the training available here proved attractive enough. Before becoming IMG Academy, the school began as the Nick Bollettieri Tennis Academy, itself an offshoot of a tennis program at the now-defunct Colony resort on Longboat Key, once one of the top tennis resorts in the country. 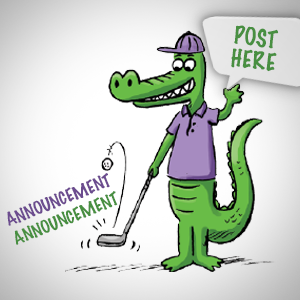 Nick Bollettieri’s reputation as a tennis coach predated his arrival in Florida, but after he moved to the Gulf Coast in 1977, phenoms flocked to the Colony resort to train under the instructor and his staff. Soon, local star Mike DePalma earned national attention, and a list of soon-to-be greats found the courts. Bollettieri set up a residence for student athletes and quickly had a group of 20 on hand and anxious to train. “They would just keep showing up, and we finally decided we needed a school,” Bollettieri recalls. His program ultimately produced such stars as Andre Agassi, Monica Seles and Jim Courier, and later the likes of Venus and Serena Williams, Anna Kournikova and Maria Sharapova all trained with Bollettieri at various times at his school. The International Management Group, a sports and entertainment company that represented athletes like Arnold Palmer, entered the picture in 1987 when it bought the school. By the mid 1990s, the rebranded IMG Academy added golf programs to its mix, then basketball in the early 2000s. The school’s profile in team sports escalated significantly with the addition of a football program in 2010. Meanwhile, the Bradenton campus grew to some 500 acres. In 2013, William Morris Endeavor acquired the entire IMG Worldwide empire for roughly $2 billion. Ciaccio, who was with the academy before and after that purchase, says the school remains as poised as ever to be an international leader in sports performance and training and to keep the academy as a vital destination drawing athletes and fans to the region. The academy has branded programs with world-class sports training such as Nick Bollettieri Tennis and the John Madden Football Academy, and offers not only professional-level programs, but also adult and family programs in tennis, golf and fitness. It has also served as a research and development facility over the years as companies like Gatorade and Under Armor have entered partnerships with the academy to test products and research sports therapies and medicines. The school touts that its graduates have pursued higher education at such prestigious institutions as Yale, Princeton, Harvard, West Point, Cornell and Johns Hopkins. That said, sports has always provided the chief identity for the institution, which through the years has drawn both young hopefuls and experienced veterans with its rigorous training. IMG Academy’s list of accomplished alumni includes Carolina Panthers quarterback Cam Newton, Chicago Bulls shooting guard Jimmy Butler and Japanese tennis star Kei Nishikori. The school holds special pro camps during the NFL offseason and offers NFL Combine training to top player prospects. An increasing number of events take place on the large campus, which opened a track and field stadium in 2014, in addition to the existing 52 tennis courts, 18-hole golf course and four baseball fields in operation. The increase in the number of spaces and hospitality venues ensures the campus will continue to grow. Ciaccio won’t speculate on what other sports may become part of the IMG offerings, but says the institution promises a high standard in quality in every field, just as the athletes on campus strive for the highest measures of success. 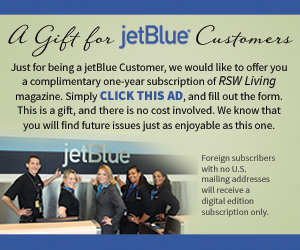 Written by Jacob Ogles, a journalist based in Southwest Florida.